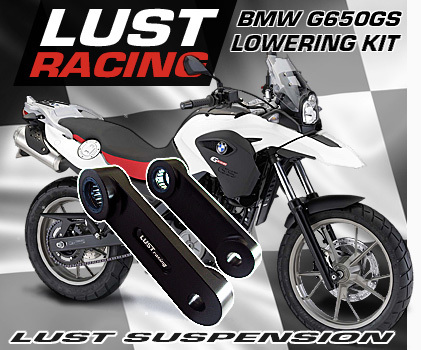 Lowering kits for BMW G650GS motorcycles by Lust Racing. Motorcycle lowering kits for BMW G650GS 2009-2015 contains two new suspension lowering links. Top quality lowering links manufactured out of aerospace 6061-T651 aluminum with pre-installed needle-bearings and seals. The BMW G650GS lowering kits on this page are designed, engineered and manufactured in UK by Lust Racing Ltd.